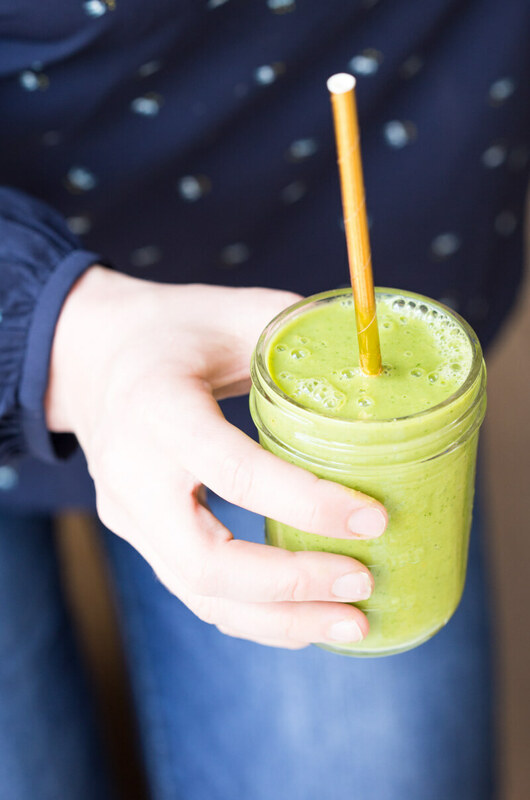 This Matcha Green Tea Smoothie recipe post is sponsored by NFRA. I’m going green over here thanks to mighty matcha. Have you tried matcha green tea powder before? This health food has caught on (and for good reason) and is becoming mainstream… like I found it at a regular grocery store the other day. Matcha is a type of green tea with leaves that are bright green in color and are ground into a fine powdery form. When you drink traditional tea, you steep the leaves into hot water and discard them, but with matcha you drink all the leaves. Eating the leaves = more potent green tea compounds like antioxidants, vitamins and minerals ANNNND caffeine. Matcha blends really nicely into a smoothie and THAT GREEN COLOR! Love it. 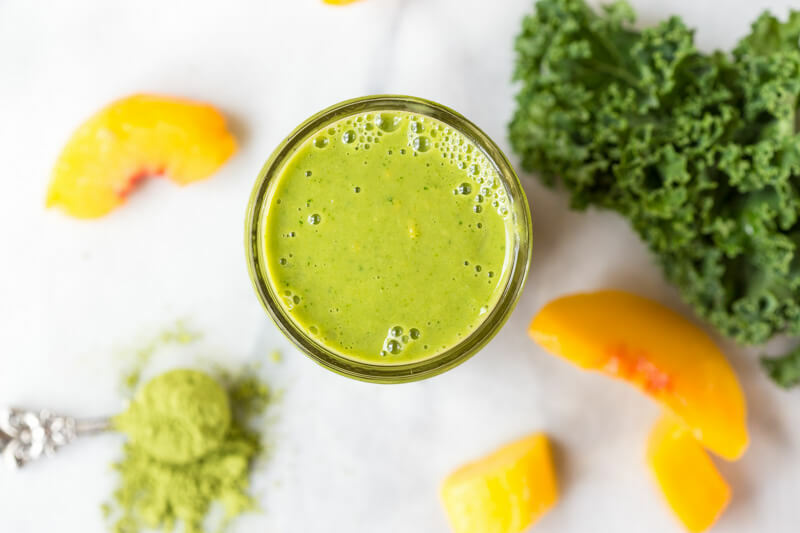 And aside from the health benefits, one of my favorite reasons to add matcha is it gives a warm and savory feel to this fruited green smoothie. 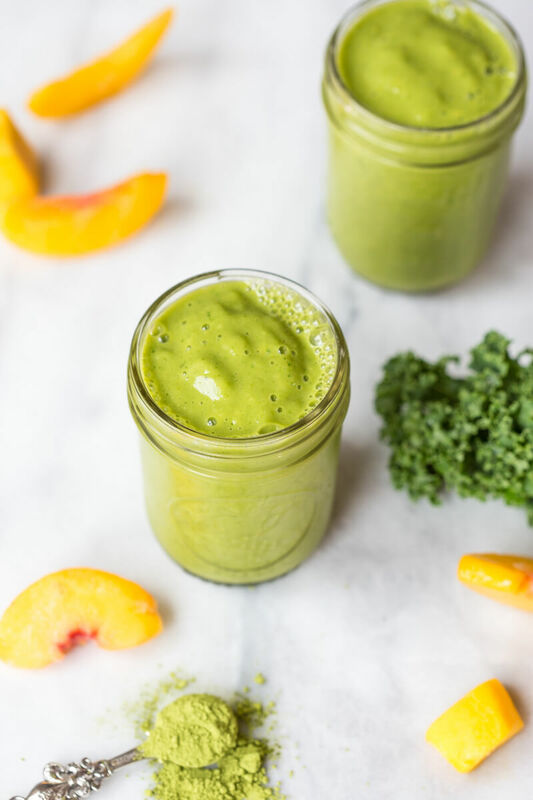 Oh and banana haters rejoice because this Matcha Green Tea Smoothie is for you! 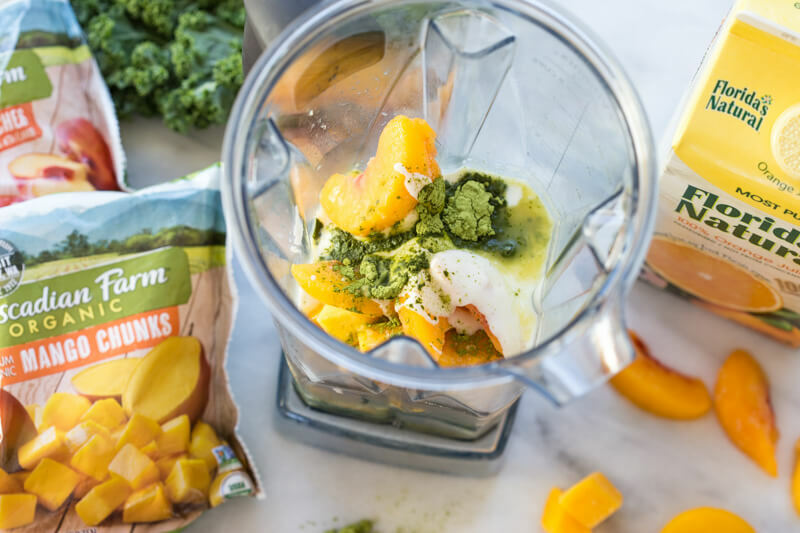 Read: NO BANANAS in the mix, and it’s still so velvety and creamy thanks to frozen mango. For those people that don’t get it (I didn’t get what the fuss was about it at first since I’m one of those– eat a banana or two every single day type of people) but I get comments and requests for banana free smoothies all the time, like ALL THE TIME. So because some of you just can’t stand the taste of banana in your smoothie… get happy because I left the ‘nanas out of the line up on this one. 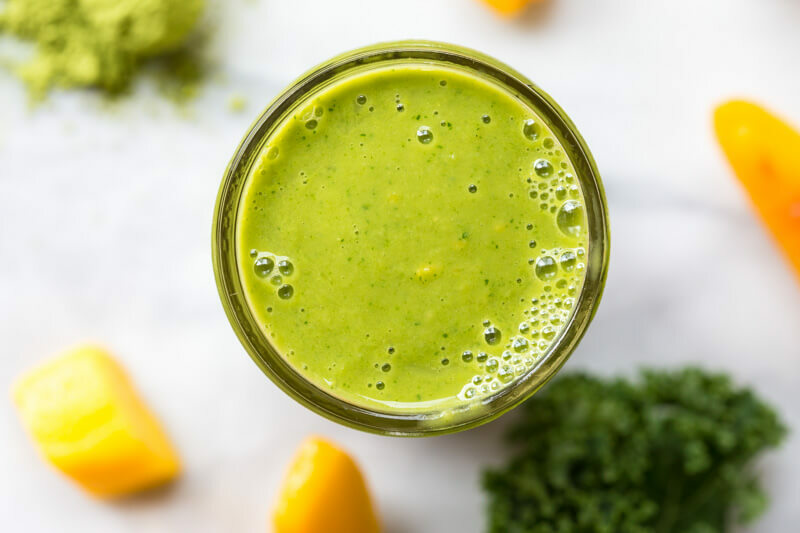 I enjoy drinking green drinks like this Matcha Green Tea Smoothie for breakfast because I get a serving or two of veggies down the hatch, first thing in the morning! And that’s winning in my book. Frozen fruit is my solution for making smoothies rock! It gives texture and a better concentration of flavors, without watering it down with ice. I keep frozen fruit on hand like these Cascadian Farm Organic mango and peaches that are diced and ready to go into a smoothie. 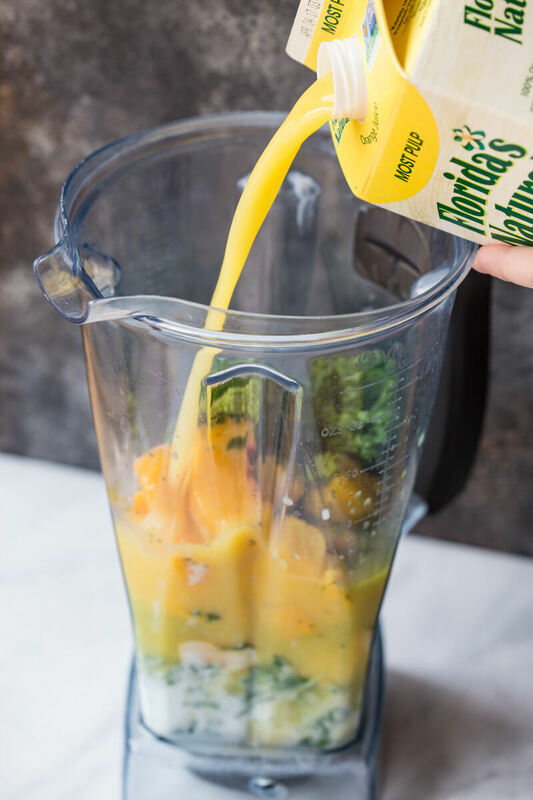 I don’t like to add sugar to smoothies, so I sweeten this one up naturally with Florida’s Natural Orange Juice, extra pulp please! I also like the tang and balance (and vitamin C) that OJ gives to smoothies. This time of year, I’ll take all the immune boosters I can get … cold and flu season has been rough on this house. For more recipe ideas inspired by foods in the freezer and dairy aisles, check out EasyHomeMeals.com. 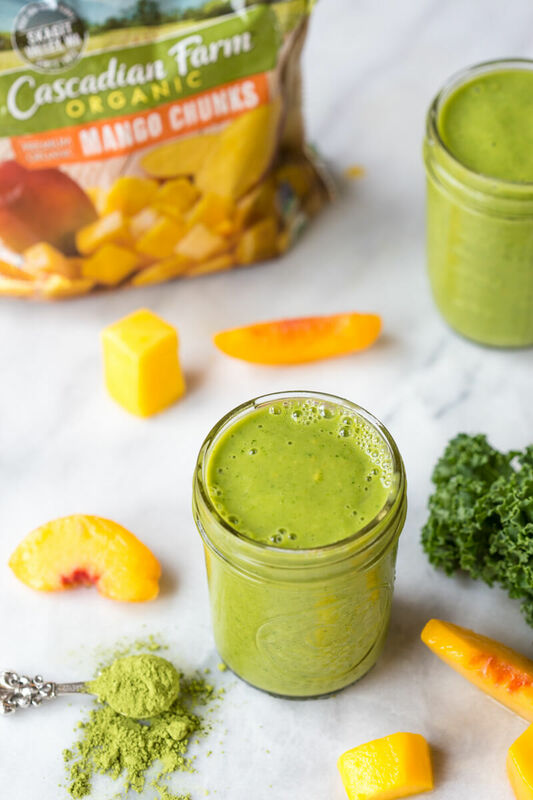 Place kefir, orange juice, matcha powder, mango, peaches, and kale into the blender. Blend until smooth and creamy. Serve immediately. This looks amazing Kristina. How do you get such a smooth texture? 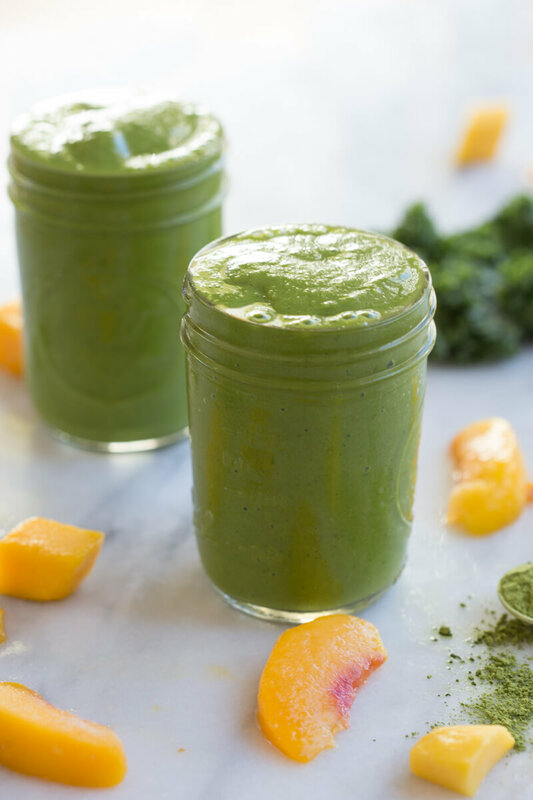 When I blend kale i end up having to chew my smoothie. I’m looking into new blenders and was wondering what you would recommend? 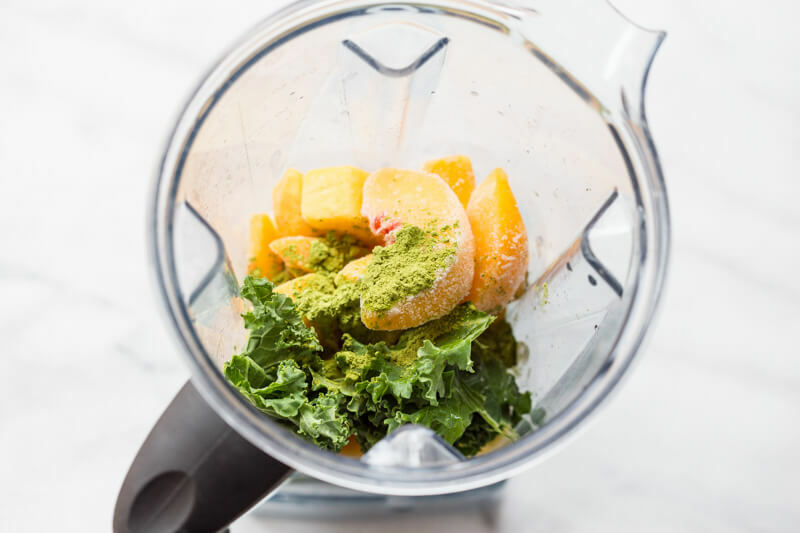 I’m looking at the Vitamix 5300 after reading this article https://livingfreshdaily.com/vitamix-5200-vs-5300-which-is-best/ but I wanted to know if you had any specific recommendations. Thanks! Hey Cammy! I use a vitamix 🙂 Had mine for 5 years now and it still works great. Yum the combination of mango and matcha sounds divine! I usually go for more of a matcha late smoothie with protein powder in it, but now I’m craving a fruit based one, and the kefir is clever too! I still have yet to jump on board with the matcha trend, but I’m thinking it’s about time I give it a go. This smoothie looks amazing! Wow! Look at that color!! 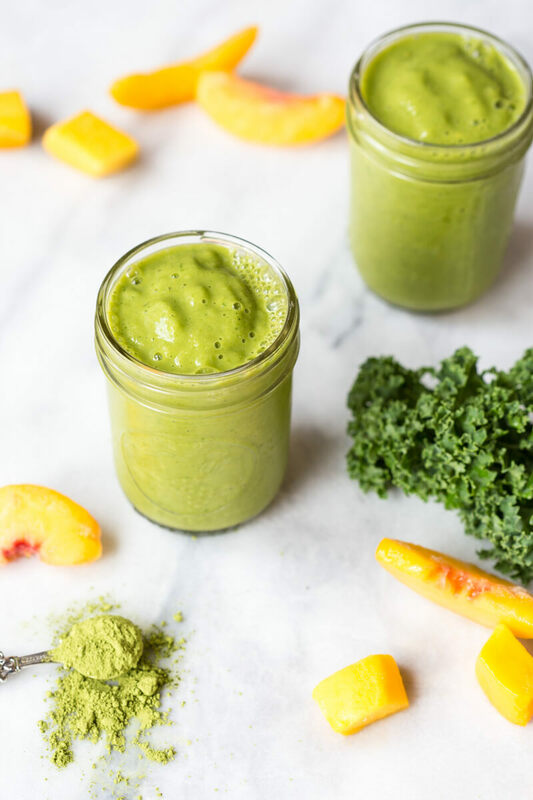 I love matcha but have never used it in a smoothie before – will definitely be trying this! Wow that looks good. I’ve never thought about eating the leaves! I’ve recently stopped drinking coffee and am drinking hot tea instead but sometimes a little more caffeine would be nice! And very pretty pictures! What’s your favorite type of matcha? I love the mango/peach pairing, amazing! Sign me up for anything with matcha! This looks heavenly :). Thanks for the recipe! I love matcha, both as a drink and as an ingredient. I recently made some matcha pancakes, which were rather good. Your smoothie looks ace. oooo! I’m going to try adding it to my pancakes next! I need all the immunity-boosting I can get right now. My kids and I keep trading illnesses. I have not tried matcha powder yet but it makes for the most gorgeous colored smoothie ever. Wonder if I could get the kiddos to drink this? Looks delicious! well I probably wouldn’t give it to kiddos that aren’t old enough to drink coffee– since it can have equivalent amounts of caffeine as a cup of coffee. I haven’t tried matcha yet. (I’m always behind!) I think you may have just sold me! I’ve tried matcha a few times, but the flavor is a little strong for me. I’ll have to try adding in fruits like these to see if that helps! This looks great! Yeah– I added 1 teaspoon for two servings and lots of fruit 🙂 You can’t really taste it too much and it kinda tames the sweetness by adding a little savory element. AMEN!! I’m all about it. And I’ve recently learned to freeze (peeled) avocados before they go bad..which always happens to me because I will eat half and then put it in the fridge– next time it’s going into the freezer for smoothies. I am having some serious breakfast envy right now! I love green smoothies!